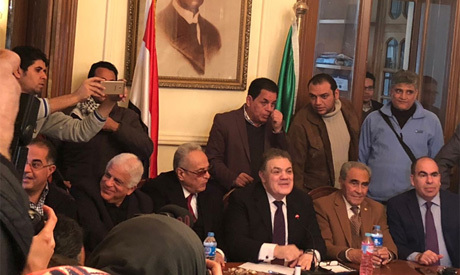 The higher commission of the liberal Wafd Party voted on Saturday not to nominate party chairman El-Sayed El-Badawi as a candidate to run in Egypt's presidential elections, which are set to take place in March. The party's 45-member higher commission reached the decision via a secret ballot in a closed session this afternoon. In a press conference held at the party's headquarters in Giza on Saturday evening, the higher committee announced their continued support for Egyptian President Abdel-Fattah El-Sisi for a second term. "President Abdel-Fattah El-Sisi managed to maintain the stability of the nation, and no one can face the challenges in Egypt except him, therefore our decision comes out of a popular desire and a desire by Wafd not to participate in the upcoming presidential elections," Hani Sarieddin, a member of the Wafd's higher commission, said at the press conference. El-Badawi's assistant Yasser El-Hodeiby told Al-Ahram Arabic news website on Saturday that his party's chairman is committed to the higher commission's decision, and will not run for president as an independent. El-Hodeiby added thatthe higher commissionrejects all forms of external interference in the internal affairs of Egypt, and calls on Egyptians to participate in the elections. Last week, President Abdel-Fattah El-Sisi submitted his candidacy documents as well as his endorsement forms to the National Elections Authority (NEA). On Saturday, Zamalek club chairman, lawyer and MP Mortada Mansour announced that he longer intends to run for president. Last week, rights lawyer Khaled Ali withdrew as a potential candidate for president, citing what he claimed to be an "unfair competition." However, the NEA later issued a statement saying Ali's allegations were unfounded and could not be substantiated. Also last week, the NEA removed former military chief-of-staff Sami Anan from the voter database after it determined that he had violated the law, which prohibits military officers from participating in the election process. The deadline for submitting candidacy requests to the NEA is Monday 29 January. If no one runs against El-Sisi, Article 26 of the law regulating the presidential elections says that the sole candidate can be elected with a 'yes' vote from 5 percent of eligible voters. The upcoming presidential elections are Egypt's third since the 25 January 2011 revolution.